If you have decided on making a business trip to India to meet your outsourcing vendor, you have made a right decision, as India is a wonderful place. You can be sure of enjoying the rich culture, scenic beauty, mouth-watering cuisine and all that India offers. Put your apprehensions behind and get ready to experience the beautiful land of India. While in India to meet your outsourcing vendor, you will find that India is a safe destination with friendly people. However, it is advisable to follow a few safety guidelines and take some precautions to make your business trip worry-free. Here are a few common don'ts that you can adhere to while staying in India. Do not forget to pack important documents like your passport, identity proof and visa. Make photocopies of your visa, passport and identify proof. These copies can be helpful, in case you lose the originals. Do not travel to India without receiving vaccines for typhoid, hepatitis, tetanus and other contagious diseases. Carry pills for malaria and diarrhea with you. Do not forget to pack any special food that you like, as you may not find the same brand or type of food in India. Don't forget to bring along any special toiletry items that you require. Don't forget to pack a hand sanitizer. Frequently sanitize your hands to avoid catching an infection. Avoid traveling late at night or in unfamiliar parts of the city all alone. Inform someone about the place you plan to visit, when leaving your hotel. Do not hire any type of transportation services or book travel tickets from unlicensed operators. Do not discuss your travel plans with strangers. Never discuss how much money you are carrying amongst strangers or in public. Do not opt for ice in your water or soft drink, as you cannot be too sure about the purity of the water. If you are carrying important valuables or confidential documents, it is advisable to keep them in the hotel locker. While travelling around India, it is advisable to carry your debit/credit card instead of carrying a large sum of money. India is a hot country, so it is advisable to wear light cotton clothes. Avoid wearing synthetic clothes, as you may develop skin allergies or heat burns. While outdoors, don't forget to wear sunscreen. Indian traffic is usually heavy and unpredictable, so do not over-schedule yourself. Always leave your hotel at least 30-90 minutes before your business meeting, to avoid traffic jams. Remember to follow your original plan and stay in the hotel that you have reserved. Do not get carried away by a stranger's offer of better hotels or accommodations. Always agree to meet your outsourcing clients only at public places. Do not hand over your baggage to an unknown person. Don't allow strangers to enter your hotel room. India is still a developing country, with a large sector of the population being poor. Refrain from displaying your wealth in public places, as this will attract unwanted attention. Don't forgot to pack all the chargers, converters, cords, adapters and cables that you require for your camera, laptop and other equipment. Don't assume that your Indian outsourcing vendor would eat meat and drink alcohol. Many Indians eat only vegetarian food. You may not find beefsteak on Indian menus, as Indians revere the cow. Follow your host's lead while looking for a good place to dine. Don't get down to discussing business right away. Introduce yourself and get to know your outsourcing vendor. 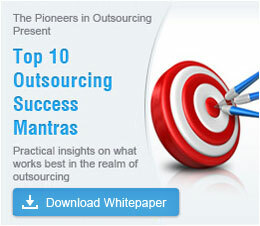 Getting acquainted with your outsourcing vendor can go a long way in making your outsourcing relationship a success.